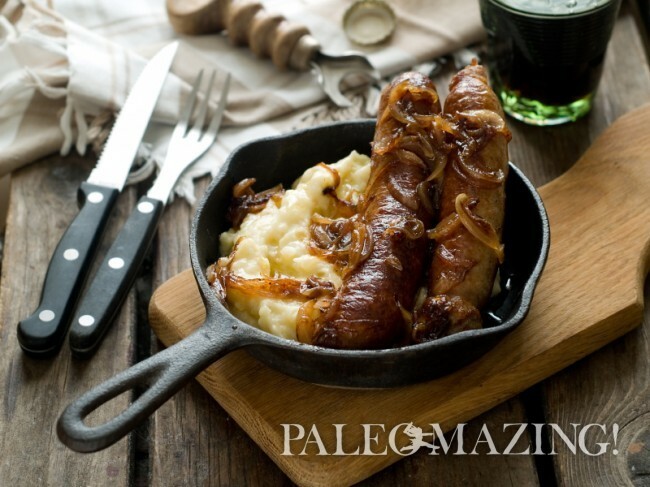 Bangers and Mash Gone Paleo! Oh dear, here I am the typical American traveling through London on my way to Brussels. I find myself falling in love with so many new ideas, flavors and recipes that I may not ever return to the States. Today’s learning experience was Bangers and Mash and incorporating this into my paleo lifestyle. Delicious! 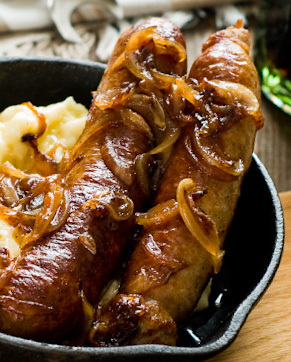 Bangers and Mash, also known as sausages and mash, is simply a very traditional British Isles dish made of mashed potatoes and sausages. Now here comes the good part! The sausage may consist of a variety of flavored sausages which are made of pork or beef or a Cumberland sausage (pork). The Irish also have a similar version and I love their onion gravy they use as well. It is usually served with onion gravy, fried onions, baked beans and peas, but that is not my style of eating unless I could pull it off paleo style. I adore potatoes, however baked beans are not my favorite, and one can never have too many onions. So here we go! I must share that this dish is very typical in the gastro pubs. A gastro pub is a pub that serves more than just beer, hence gastro which is short for gastronomy. Pubs were always pubs but they added a bit of quick yet hearty food over the years as people would hang around and get hungry, so they eventually listened and served some food. They soon became Pub Grubs. Sounds fitting, right? Well, it lasted a good many years until 1991 when two men, David Eyre and Mike Belben took over The Eagle pub in Clerkenwell, London. The whole idea of a restaurant in a pub became a sensation to both pub culture and British dining, so now we have gastro pubs, just pubs and some may prefer to call their pub a Pub Grub to adhere to old time lingo, but not that often. So how did the name “bangers” come about? A little bird told me that Bangers and Mash got its name because sausages used to burst (or bang) while cooking, due to rusk (dried bread) being added to the meat. Make sure you check the ingredients of your sausage and read your labels always. Gluten is added in quite often as well as barley malt. 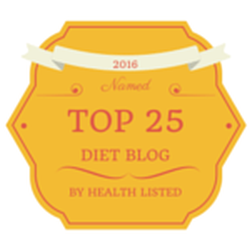 Please remember to peel your potatoes, and this way you’ll be fine in adhering to the theory about toxins with potatoes and paleo. You can also try this bangers and mash recipe with my Paleo Cauliflower Mashed Potatoes if you prefer not to eat potatoes as some do. This is a very inexpensive, traditional dish. Try to use a very good quality sausage or perhaps even a bratwurst. This is key to the dish. This is very much paleo comfort food at its finest… one of these days I will also have to figure out a version of paleo meatloaf to share with my family. Of course, this being a British dish, I would of course recommend ending the meal with warm scones like my Paleo Blueberry Scones. Enjoy! Cut potatoes into 1-inch even cubes. Steam water and add potatoes to top of steamer basket. Let steam on medium heat for 15 minutes. Remove from heat and add potatoes to a heatproof bowl. Add slowly while stirring the other ingredients and mix it all. Now use a masher and get it all incorporated very well. Cover tightly with foil and place in oven. Heat LARGE skillet on stove with butter/ghee inside the skillet. Cook on medium heat until thoroughly golden (crisp on outside if you like). Cooking time will be around 5-7 minutes per side. Remove and place in heatproof dish and cover and place in oven. Leave oils and juices in pan for the next step. Slice onions thinly into rounds. In the same skillet, heat the butter/ghee. Cook for about 6-8 minutes on medium until translucent AND browning. Stir and leave on medium heat until the liquid starts to reduce. When reduced by about half, add salt and pepper to taste. Add potatoes to a plate, add a sausage or two on top or to the side and then spoon the wet broth and onions on top. Repeat this with as many plates as needed depending on your number of guests. This sauce is not a thick gravy as I do not like that type of gravy. I prefer clean and vibrant flavors, like in this recipe.